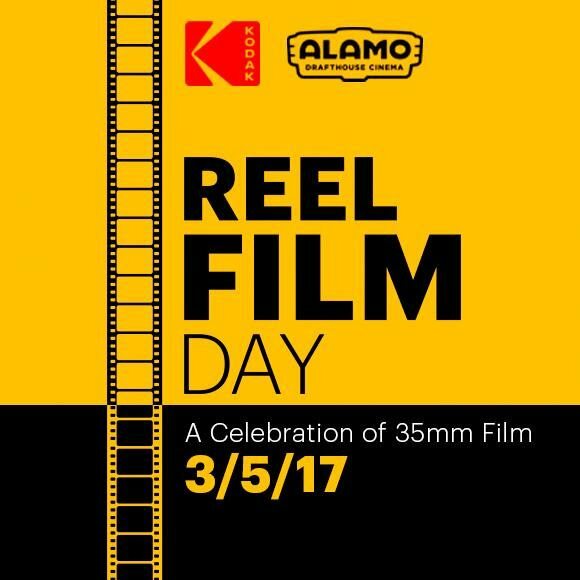 Austin, Texas (February 16, 2017) – Mark your calendars, cinephiles. 35mm film will be alive in all its glory on March 5 — or 3.5. A collaborative initiative from Alamo Drafthouse and Kodak, the first-ever “Reel Film Day” will champion the beauty of cinema’s richest and most enduring format with celebratory screenings at Alamo Drafthouse and independent theaters across the U.S.
Other theatres that project 35mm film are encouraged to join the initiative and can contact sarah.pitre@drafthouse.com for more information. Tim and Karrie League founded Alamo Drafthouse Cinema in 1997 as a single-screen mom and pop repertory theater in Austin. Twenty years later, the now 26-location chain has been named “the best theater in America” by Entertainment Weekly and “the best theater in the world” by Wired. The Alamo Drafthouse Cinema has built a reputation as a movie lover’s oasis not only by combining food and drink service with the movie-going experience, but also introducing unique programming and high-profile, star studded special events. Alamo Drafthouse Founder & CEO, Tim League, created Fantastic Fest, a world renowned film festival dubbed “The Geek Telluride” by Variety. Fantastic Fest showcases eight days of genre cinema from independents, international filmmakers and major Hollywood studios. The Alamo Drafthouse’s collectible art gallery, Mondo, offers breathtaking, original products featuring designs from world-famous artists based on licenses for popular TV and Movie properties including Star Wars, Star Trek & Universal Monsters. The Alamo Drafthouse Cinema is expanding its brand in new and exciting ways, including Drafthouse Films, founded in 2010, which has already garnered three Academy Award nominations and Birth.Movies.Death., an entertainment content platform for movie lovers.